Italy is a country often revered for its gastronomic offerings, from culinary creativity in modern fusion restaurants through to the classic pasta and pizza dishes that are loved the world over. But here, in the heart of the country, you’ll find Emilia Romagna: a region rich in palatable plates and epicurean adventures. Food isn’t just something on the menu in Emilia Romagna, it’s the main course. Sure, the beautiful old-town of Bologna and the hill villages of rolling vines are reason enough to visit, but the real reason to stay is the gourmet delights that can be found spread across the region. It’s a bold claim, but I’m going to call it. Emilia Romagna may just be the home of food, and for that, it will always be home to a part of my heart. While Bolognese sauce is a go-to in the western world, especially when talking about Italian cuisine, we are actually getting it all wrong! 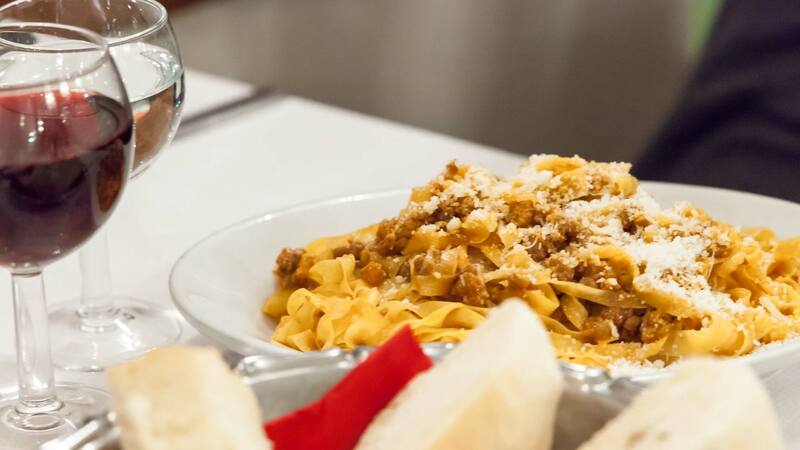 Bolognese may have the name of the Emilia Romagna capital, Bologna, but around these parts it’s Ragù – so don’t utter the dreaded B word here. Ragù is a richer and thicker sauce, which has more meat and additional carrots and celery. 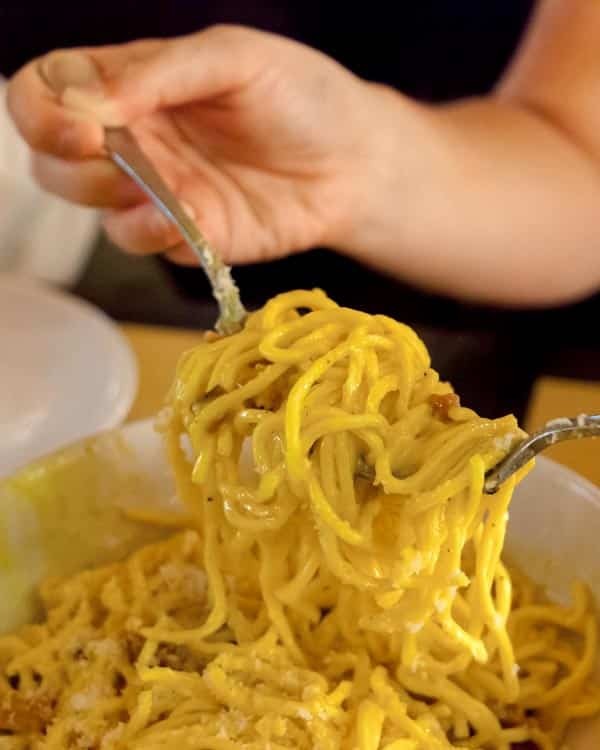 Dating back to the 18th-century this staple is most often served on Tagliatelle rather than the ‘Spag Bol’ us culinary creatures in Britain refer too. Tortellini, a stuffed almsot circular pasta is also from the Emilia Romagna region, but I prefered these with other ingredients than the Ragù, which tasted incredible on Tagliatelle or in a lasagne. 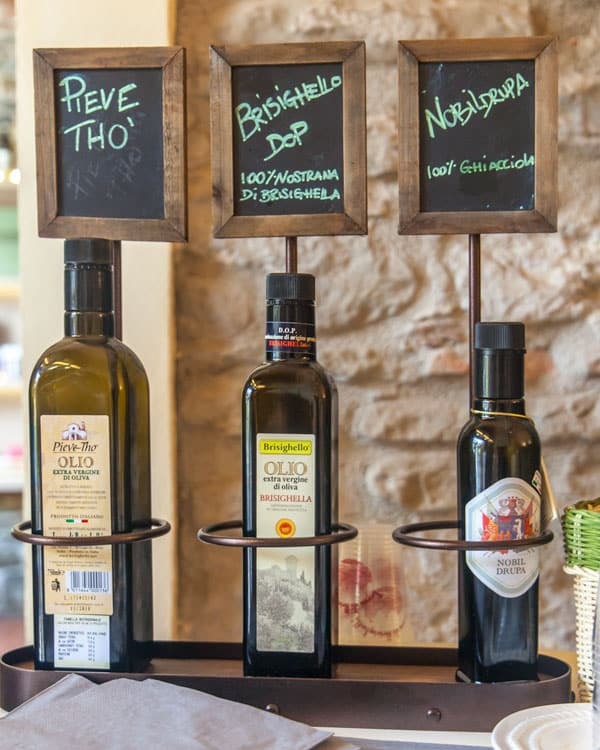 Italian Olive Oil is a staple in kitchens around the world, and with good reason. I actually learnt during my food tour of Spain though that some of the Olives are grown in Spain as Italy simply can’t keep up the demand. 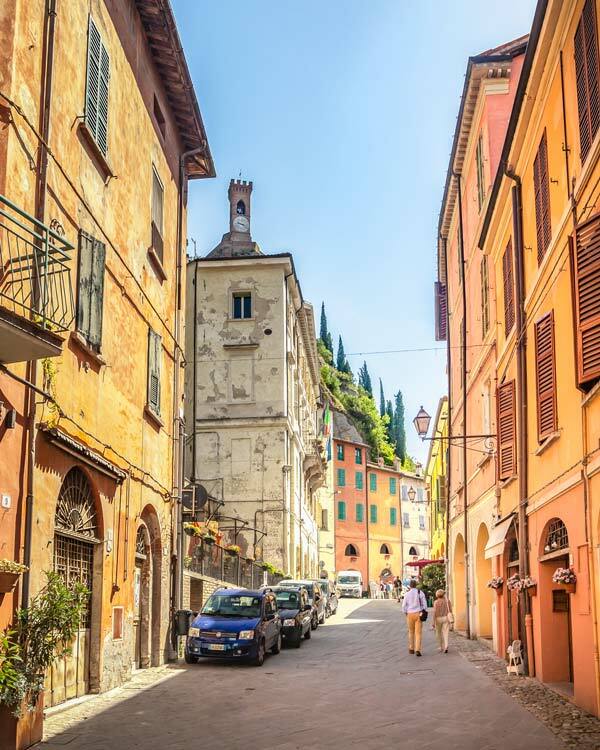 Take yourself on an Olive Oil tasting tour while you are in Emilia Romagna, one of the dreamiest and best places to do so is in the adorable village of Brisighella. Famed for its production due to the unique variety of olive fruit it produces, partly due to its low climate, the small stores in the village will happily fill you in on the facts, and let you sample its unique flavours. In various greens and golds, and a mix of spices and bitter flavours, tasting olive oil turned out to be quite an art. Many swear by sampling it straight from your hands, and then sniffing your skin as the PH levels act as a neutraliser. While bread is one way to do it, those in the know told me the bread ruins the tasting of the oils flavours. If you are a cheese lover, then this might be the best foodie activity you’ll ever do. Parmigiana Reggiano is a protected name, only able to be given to this type of cheese produced here in Emilia Romagna, mainly around the Modena and Parma regions. 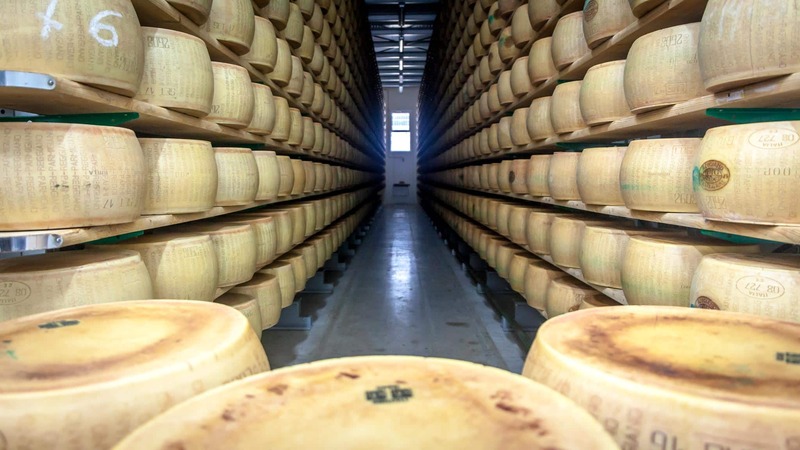 Here you can see how the cheese is soaked, produced, set and stored; and in the storerooms, you’ll be amazed at the racks and rows of cheese wheels, perfect for a cheeky Instagram. 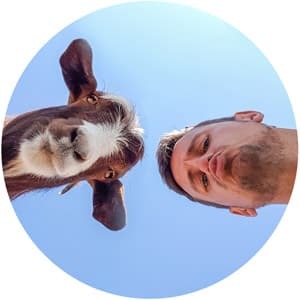 The process usually starts quite early in the morning, so to see the full way of traditionally producing Parmigiana Reggiano, book an early morning tour. Some call it heaven, others call it hell, but whatever your views, this new foodie theme park in Emilia Romagna is a big deal. Located a short bus ride or drive outside the city of Bologna, here you’ll find a sprawling mix of buildings, farmland, factories and classrooms. At FICO you can literally eat your way around the country, with the various stands at the giant food market supplying all the Italian goodness you could dream off. You can dip into one of the small production rooms to see how items are made, ideal if you are on a Bologna city-break and can’t venture out for a full tour. Classes, wine-tasting, gelato workshops; whatever Italy foodie fantasy you can think of, it can be played out here. By the way, FICO is so big, you can actually hire little bikes to get around it! If you are a carnivore foodie, then Prosciutto is likely something you’ve had on your palate before. But Prosciutto di Parma (Parma Ham) is of course from right here in the Emilia Romagna region. If you want to sample this delicate, sliced and cured meat at its source, then head to Emila Romagna’s second city. 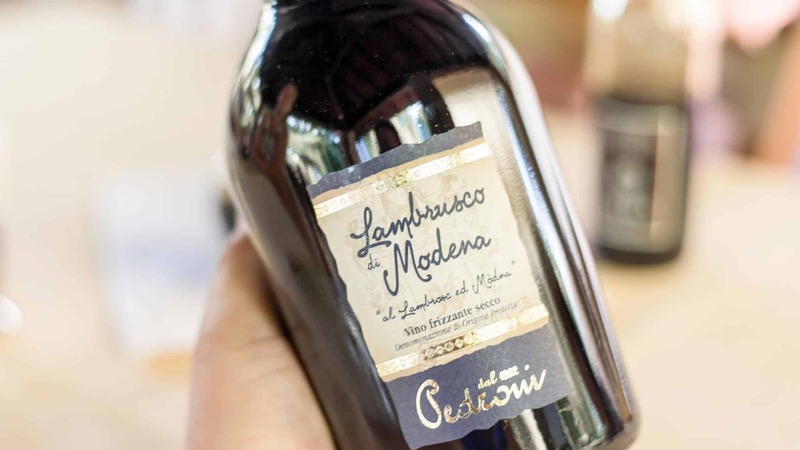 The Lambrusco grape is, of course, the main ingredient of Lambrusco wine, a lightly sparkling, usually ruby red wine that hails from the Emilia Romagna region, although it is also grown in Lombardy. 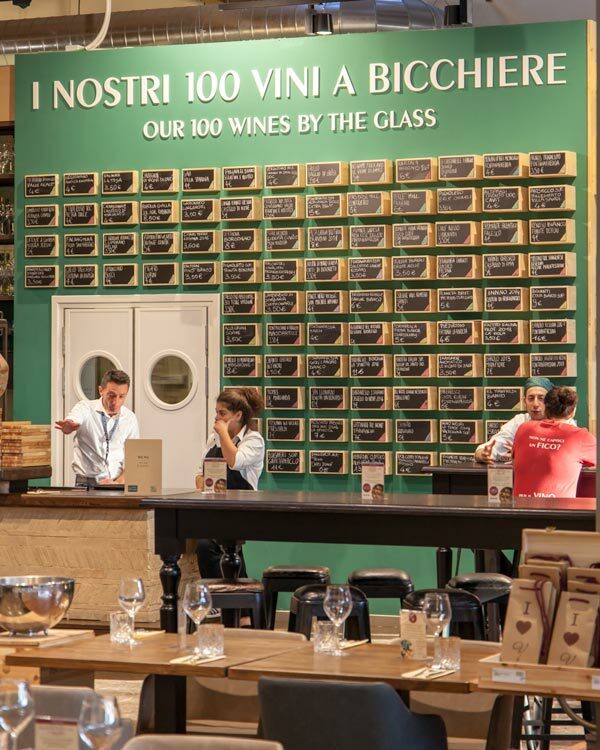 The primary sources of Lambrusco wine are around the cities of Parma, Reggio-Emilia and Modena, so visiting the vineyards here is the best place to sample it at its root. 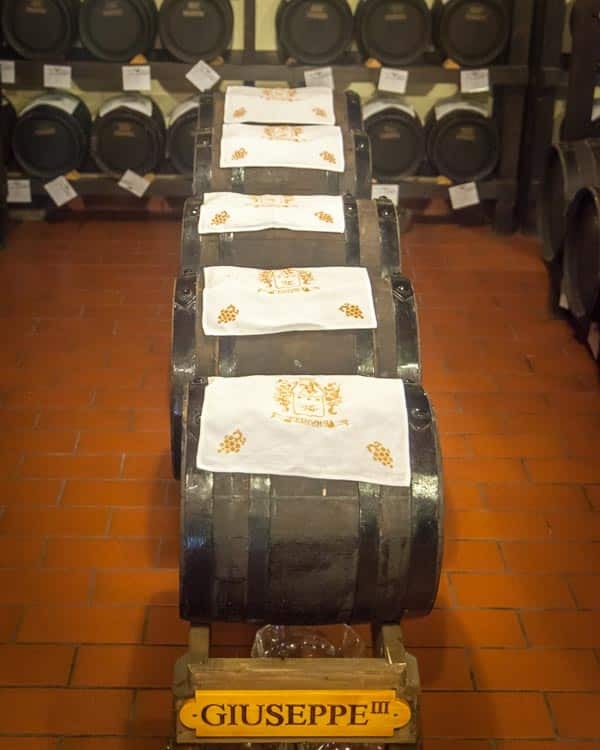 The true Balsamic vinegar also hails from here, and the Modena PDO (protected designation of origin) will always hold the trademark on the label. Balsamic vinegar tasting is quite a thing here, with some traditional vinegar having been aged up to 50 years. I visited the oldest producer of Modena Balsamic Vinegar, Giusti, and took a tour of the estate which was fascinating. The family have owned and operated here since the 17th century. If you take a tour, you’ll learn the various stages of production and ageing, stored in a similar way to wines. 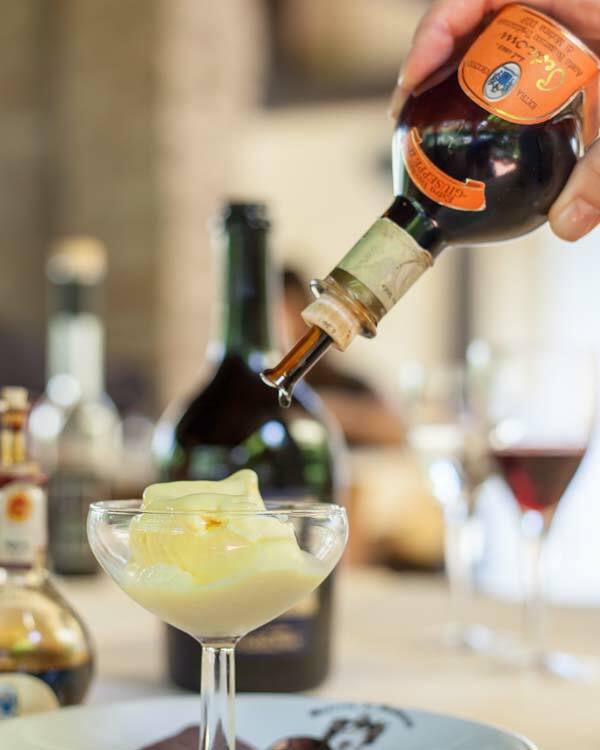 Older vinegar is thicker and sweeter and made a surprisingly good topping to an ice-cream dessert. 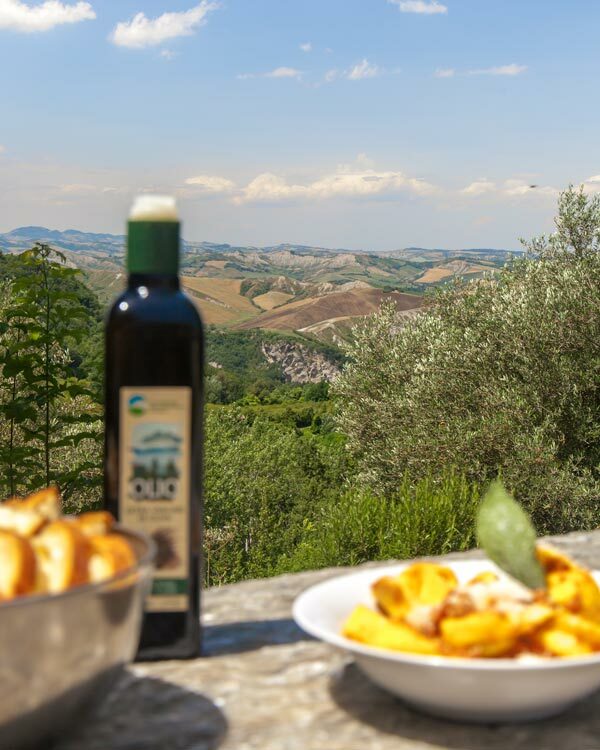 If you enjoy lunch at the restaurant on site after the tour, you’ll be able to sample the various types of Modena Balsamic Vinegar paired with local foods. Not to be confused with Sushi, the cruo, or in this case, Pesce Crudo (raw fish in Italian) is perhaps best enjoyed in the seaside city of Rimini. Fisherman have been consuming raw fish here for years, enjoying their catch with lemon or another marinade, and the tradition still lives on to enjoy this treat al fresco with the ocean breeze as company. If you venture to Emilia Romagna, do sample the Crudo, something entirely different from a Ceviche or Sashimi. Across northern Italy, as the day winds to an end, there is no better way to relax than enjoying Aperitivo hour(s). Somewhere from 6 pm onwards, friends, lovers, families and strangers come together to enjoy a delicious cocktail; whether its an Aperol Spritz, Negroni or other. Included in the Aperitivo price is food; which may range from some finger bites to a full-blown buffet. In Emilia Romagna, my favourite place to indulge in this must-be-tested tradition was Piazza Maggiore, and I highly recommend you do the same. The Barbarossa grape hails originally from France and the Liguria region of Italy but has also been grown in Emilia Romagna for some years. This fruity red, or often rosé wine, is, therefore, a great one to sample in the region and pairs well with the gastronomic treats you’ll find on every corner here. Now, this is my idea of heaven, and although I wasn’t able to join an official Gelato tour, I had fun doing my own. 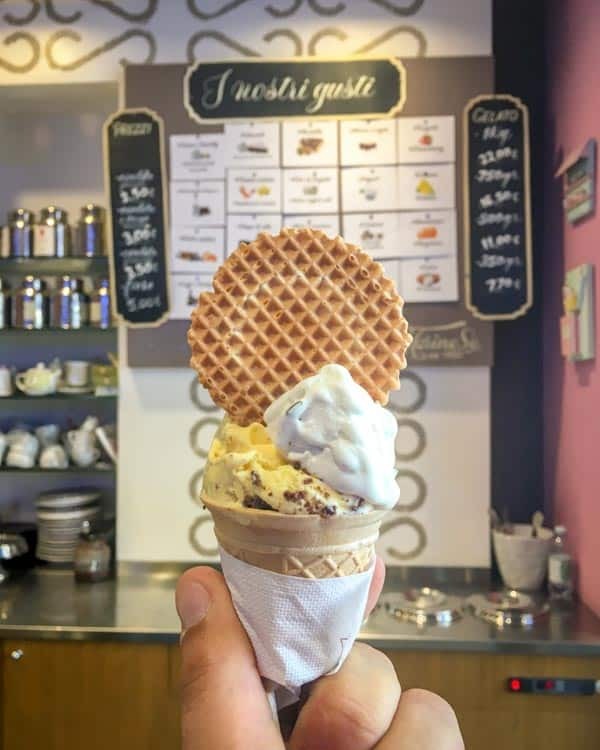 The official Gelato Tours of Bologna was raved about by my friend Rachelle, who told me the guided city walk took in multiple flavours, plenty of history and gelato based facts, and of course, lots of gelato gorging. 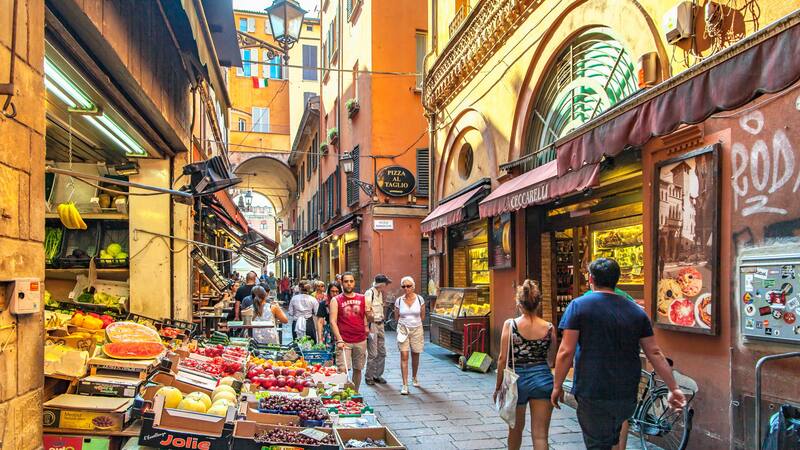 Ranging from modern stores with new fangled flavours, to the oldest Gelato store in Bologna, this is the perfect way to tantalise your taste buds in the beautiful old city centre. The streets of Bologna make for a world of food discoveries, some in plain sight and many well hidden. What you’ll struggle to find here though is, thankfully, a bad meal. 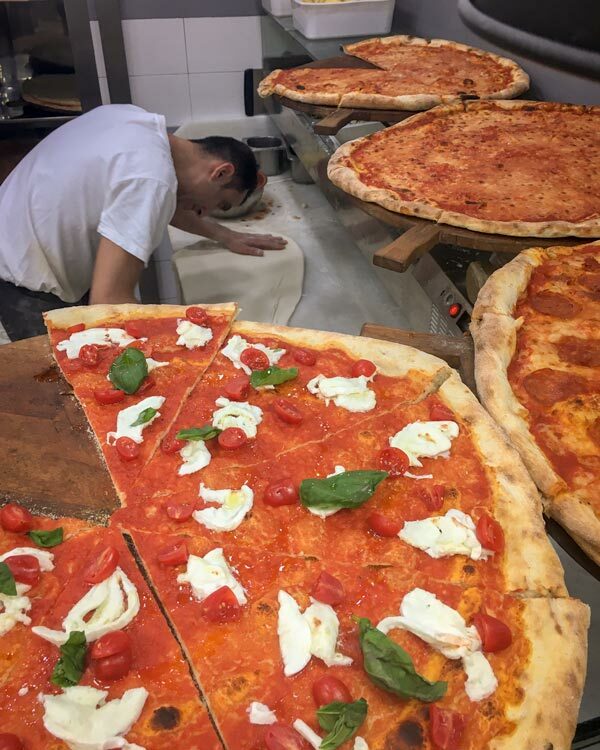 Some of my favourite pizza ever was eaten on the streets of Bologna and costs are much more favourable from a window vendor here than a fancy restaurant in Rome. Pizzeria Due Torri is a staple recommendation for me, where huge slabs of pizza can be enjoyed cheaply with the best view of the city, located just alongside the two leaning towers. Down side streets, even in residential areas, you’ll find plenty of small, family-run restaurants that may not look like much from the outside, but down little staircase, or behind closed doors, a treat awaits. Menus are often seasonal, and sometimes just verbal. If you find somewhere without an English list and a handful of options presented by the server, you are likely in for a tasty treat; Osteria dei Grifoni was one of my favourites finds. 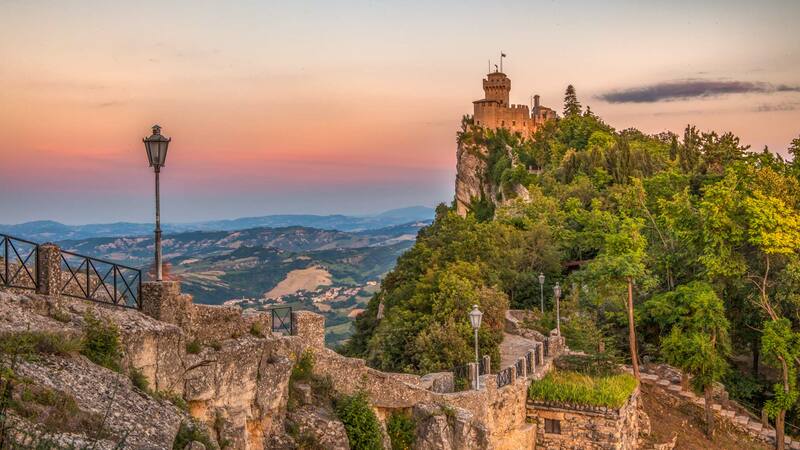 But of course, inside the Emilia Romagna region is another country; San Marino. 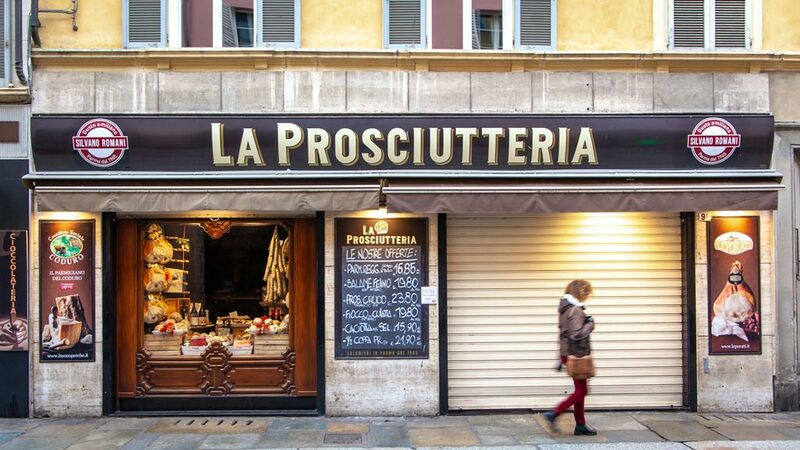 Completely surrounded by Italy, this republic is also home to its own flavours and productions, and a little side-trip is a must when you are here. Omg that pizza tho… man, maybe one of the biggest reasons why I love traveling is food. Trying out different cuisines is something so amazing, and it makes you connect with locals on a whole other level.